HP Umpire Jeff Nelson ejected Padres Hitting Coach Phil Plantier for arguing balk no-calls (Unsportsmanlike-NEC: Late Argument) in the bottom of the 5th inning of the Rockies-Padres game. With two out and one on, with Padres batter Alexi Amarista at bat, Rockies pitcher Juan Nicasio unsuccessfully attempted to pick off Padres baserunner R1 Will Venable on two separate occasions before Venable was caught stealing second base, (called out by 2B Umpire Laz Diaz). Plantier was ejected following the inning for arguing two separate balk no-calls on Nicasio's pickoffs, the call was irrecusable. * At the time of the ejection, the Rockies were leading, 3-2. The Rockies ultimately won the contest, 3-2. This is Jeff Nelson (42)'s second ejection of the 2014 MLB Regular Season. Jeff Nelson now has 6 points in the UEFL Standings (4 Previous + 2 MLB + 0 Irrecusable Call = 6). Crew Chief Jeff Nelson now has 2 points in the UEFL's Crew Division (1 Prev + 1 Irrecusable = 2). *Pursuant to UEFL Rule 6-5-c, Quality of Correctness only applies to the call made directly prior to ejection. Because the balk no-calls in question occurred prior to the pitch that directly preceded ejection, this ejection is irrecusable. This ejection is not eligible for a Post-Inning Exemption as the "one specific call" criterion cannot be satisfied when a coach counts multiple perceived missed calls (multiple plays as opposed to one specific call). Prop Prediction 1-2: Date of First Ejection of non-player/non-manager: Winner: Arik G (4/15/14). 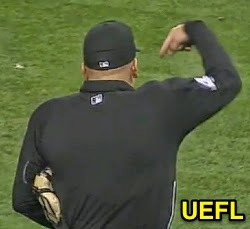 This is the 8th ejection of the 2014 MLB Regular Season. This is the Padres' 1st ejection of 2014, 1st in the NL West (SD 1; ARI, COL, LAD, SF 0). This is Phil Plantier's first ejection since July 24, 1994 (Steve Rippley; QOC = U). This is Jeff Nelson's first ejection since April 8, 2014 (Rick Renteria; QOC = Y).